But burek goes beyond just a dry definition – burek is ćejf, merak (two words that mean more than simply “enjoyment”! ), it’s a culinary delight, the king of all pitas…. So when they say in Sarajevo: “All pitas are pita, but only burek is the real thing”, they mean it! So we’ll clarify things right at the start: In Sarajevo, “burek” wouldn’t be made without meat, like it is in other countries and cities throughout the Balkans! “Burek” with cheese, spinach or potato doesn’t exist in Sarajevo! They’re special varieties of pita – sirnica (cheese pie), zeljanica (spinach pie) and krompiruša (potato pie). Burek is made using soft flour, ground meat, red onions, pepper, salt and oil. The thin phyllo dough is worked by hand, usually by using a thin wooden rolling pin (oklagija). The dough is then filled with the fil (the mix of ground meat, onions and spices), rolled and placed in the tepsija (a shallow, metal baking pan). The filled rolls of phyllo dough can be arranged in rows that are placed next to one another until they fill up the entire pan, or they can be shaped into individual zvrks (spiral-shaped pies) and placed in the pan. At some places you might even find polagani bureki, where the pans are full of alternating layers of phyllo dough and filling. We heartily recommend that you eat hot burek with yogurt. 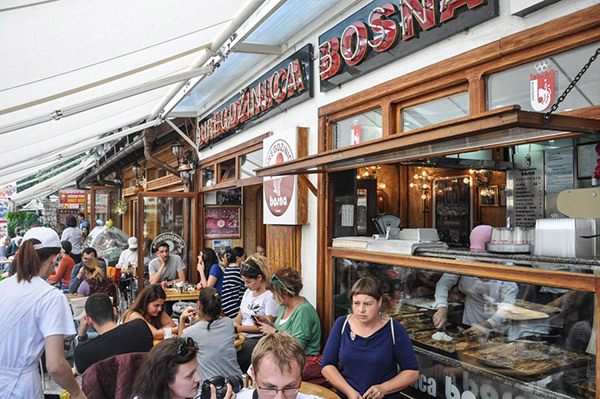 You should also know that in Sarajevo, burek and ćevapi make for quite a cult food combination. 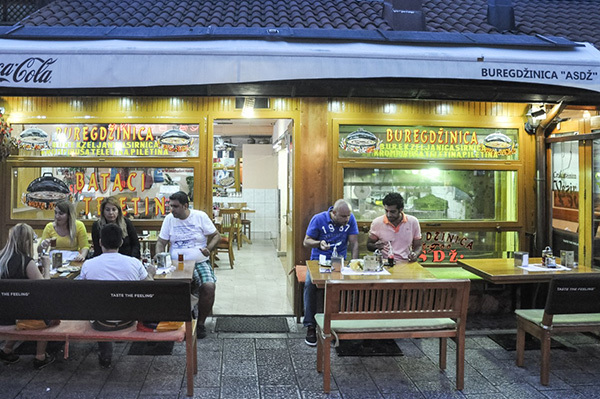 A buregdžinica is an eatery where one can truly enjoy burek and here we offer our picks for the best buregdžinicas in Sarajevo! The most popular buregdžinica in Baščaršija. It’s located on Bravadžiluk Street, just a hundred meters from Vijećnica, the monumental work of architecture from the time of Austro-Hungarian rule in BiH. Here burek has “something” that sets it apart from others. Many people compare a meal at Bosna with the enjoyment one derives from drinking Bosnian coffee! This buregdžinica is located on Titova St., near the corner of Radićeva St. and BBI Center. 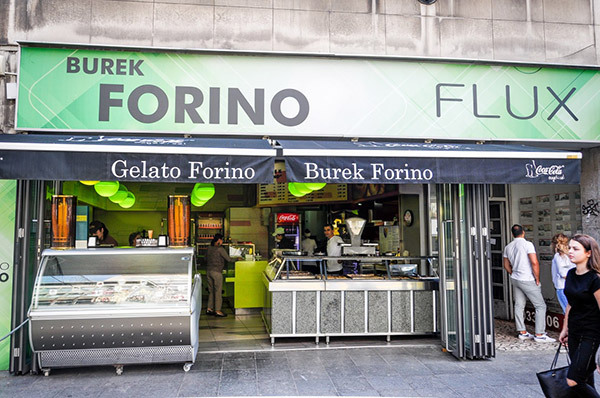 Forino’s burek has a specific, let’s say, Mediterranean aroma and, while it’s eaten quickly, it isn’t easily forgotten. Given its location right in the center of town, it’s hard to miss. It’s a good spot to stop for a break while walking the streets of Sarajevo. Dervoz has a tradition going back 43 years. This buregdžinica is near the BiH Presidency building. Once you get to the intersection of Titova and Koševo, you can reach it by heading north and following Koševo St. for about 200 meters. It’s said that the original recipe for this burek is kept in a safe. Ladies prepare the burek but, before it’s baked, the owner adds the final ingredient, which only he knows. It’s quite a delicacy! 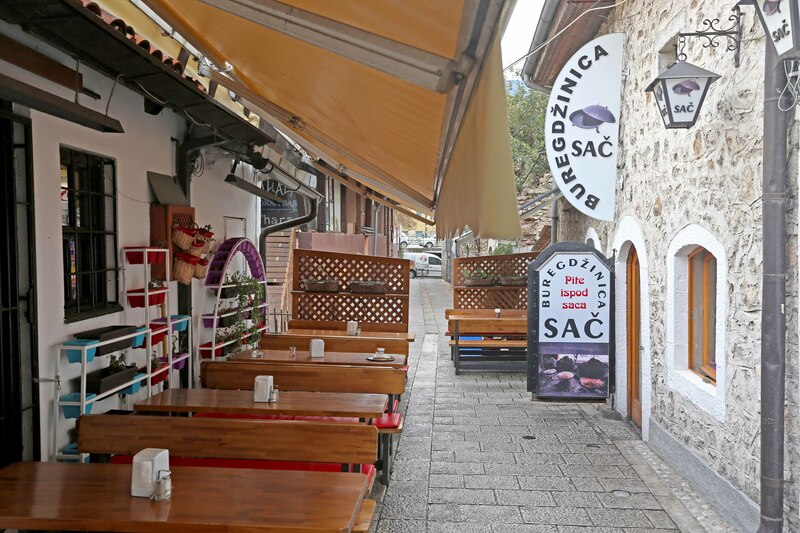 Bećiri is in a building right next to Markale Market on Mula Mustafe Bašeskije St., and can be reached by crossing the tramway at the market and heading toward Cathedral. It’s known for preparing burek from meat that has marinated overnight in yogurt. Here you’ll enjoy eating burek as much as having some Guinness at a pub in Dublin. A must-visit. 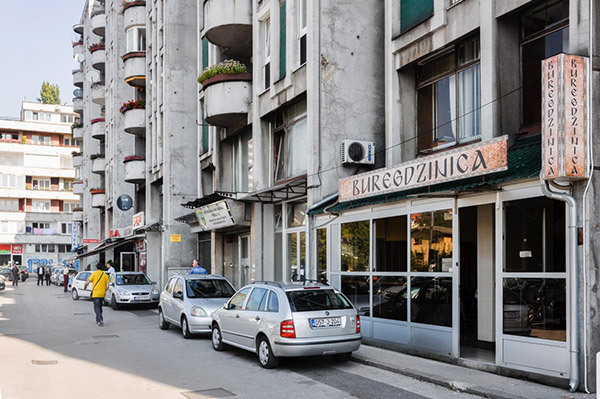 This buregdžinica is located in the first building on the right-hand side of Hamdije Ćemerlića St., before you come to the traffic light at the intersection in Pofalići (heading in the direction of Ilidža). 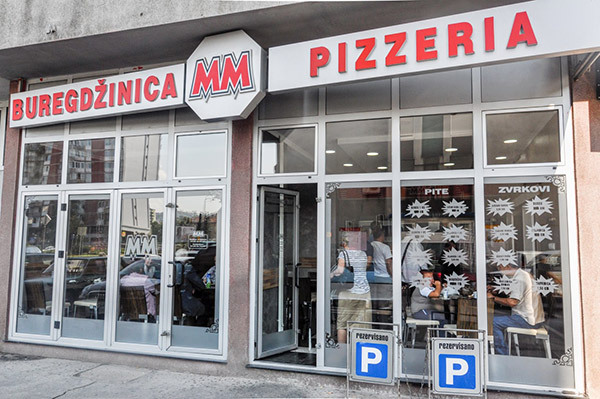 This eatery was opened recently by a Macedonian who moved to Sarajevo and brought that “special something” from his homeland in the southern Balkans (Macedonia was also under Ottoman rule). His burek stands out because just the right measure is used when making the fillings – not too much of any one thing and just the right amount of everything else! This buregdžinica is also located on Hamdije Ćemerlića, just 50 meters from Dulet. It has an “annex” behind the Faculty of Veterinary Science in Dolac Malta. This burek appeals to the widest segment of burek-eating customers, which means: it’s not oily, it has plenty of onions and pepper and the dough is never tough. All of this is very important. This is the best buregdžinica in Ilidža. It takes its name from one of the burek “presentation styles”. A burek aficionado claims that Zvrk’s burek smells like something you’d like to eat during your lunch break. Location: when you get out of the Number 3 tram at the terminus (the final stop for the Baščaršija-Ilidža tram line), Zvrk will be straight ahead of you. Just walk another hundred meters…. This buregdžinica is on Envera Šehovića St. It’s famous and legendary! When looking at the main entrance of the Dolac Malta post office, just look a little more to the left. Nagib is in the building closest to you on the left-hand side of the road. Those who know their burek say that you’ll find the best phyllo dough here. It’s the crispy kind, like when you’re eating potato chips. That’s a real art. And the burek? It’s outstanding! 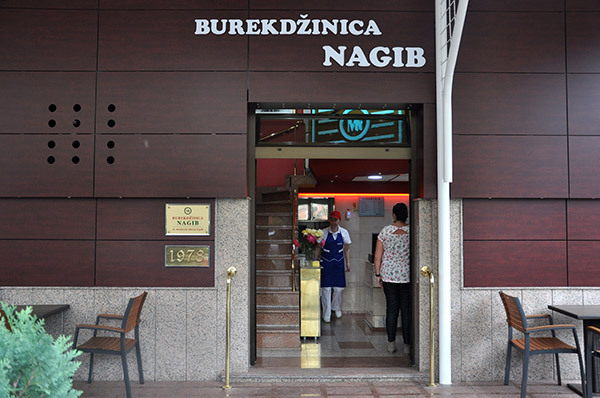 Melina is just seven or eight steps away from Nagib, so it’s located in the same building and on the same street, and Melina’s owner is the brother of the owner of Nagib! But they don’t make their burek according to the same recipe. Melina’s filling is a bit “juicier”, as though you’re eating some kind of ripe tropical fruit. There might be times when you’ll have to wait in line to try their burek, but it’s essential to have patience. This is the “youngest” buregdžinica in “the contest”! It’s the perfect place for new food trends and is considered “in” by those who tend to avoid “hot” foods, which means less pepper and fewer onions. Oklagija’s burek has quite the following among those who don’t like burek for the same reason that many love it – the onions and pepper. Oklagija has two locations: one near the Municipal Court, on the corner of Branilaca Sarajeva and Šenoina, and another on Bravadžiluk St. in Baščaršija. There’s another buregdžinica on Bravadžiluk called ASDŽ. There used to be an aščinica here which moved to Čurčiluk Mali St., also in Baščaršija, and a buregdžinica remained in the old location. The fact that this place is always busy, day or night, says it all! A well-known fact: burek from ASDŽ has received the highest rating on even the most rigorous quality control inspections. Abdul-Džemil Selmani opened his buregdžinica on Mali Bravadžiluk, which comes out onto the much longer Bravadžiluk St. in Baščaršija. He named his eatery Sač, after the metal or clay bell-shaped lid used to cover food while it is roasting. Many believe that bread and veal are best prepared under a sač, and many kinds of pita (pie, burek) are of the same caliber when "baked" under a sać. The reason for this is that moisture condenses from the heat and burek, for example, roasts in its own juices. The result is a moist and delicious meat dish that is so tender it almost falls apart. A medium-sized portion of burek (300g) costs 3.60 KM. In short: Even a man who is full can still eat burek at Sač! 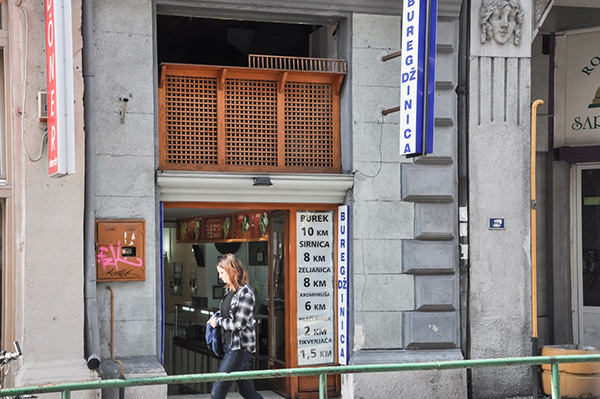 In closing, just to share another very important point: You can eat your fill of some fine food for just 5KM (€2.5).